PETCO.com offers apparel, beds, biscuits and treats, books and media, bowls and feeders, carriers and crates, clean up, collars and leashes, dog houses, flea and tick, food center, gates and doors, grooming, health care, id tags, pet memorials, petcare, pet insurance, rawhide and chews, shed control, steps and ramps, toys, training and behavior or anything else you might need for your dog, cat, fish, small animal, reptile, amphibian, bird or wild bird. Visit 58Coupons.com for the best Petco.com coupons, Petco.com savings and Petco.com free shipping offers from PETCO.com. Petco.com is offering 17% off everything. Click to view code. Act now to get Free Shipping with your online order of $60 or more when you shop at PETCO.com. Click link now. 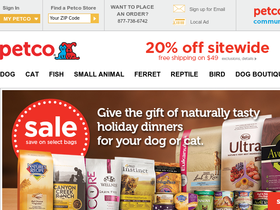 Use this code from PETCO.com to save 10% on your purchase of food or litter. Click link now to shop.